Presentations, especially good presentations, are rarely taught at school, at university, or at work. As a result, presenters tend to simply copy what everybody else seems to be doing. So for years, they were copying the bad habit of bullet points. These days, they copy what they think is the trend to "use pictures". But visuals in presentations only work if they are relevant to your topic and have been selected with some care and thought. So it's important that you don't use the first image that comes to mind when you think of a point that you want to visualise. Ask yourself what it really means in the context of your presentation. Don't fall into the trap of trying to visualise too generic an idea - since the result will be an equally generic visual that will fail to make the desired impact. As an example, consider the idea of "quality". You may want to point out the high quality of your product on a slide. What visuals can you come up with? When I do this as an exercise in my workshops, the results are usually all over the place - and not very memorable (though occasionally funny). My point here is that such an abstract concept will mean different things in different contexts. The actual quality of your product may be the speed at which it's doing its thing. Or that it's very exact in what it does. Or that it's very robust. Or something else entirely. In other words, you have to get away from the abstract idea and find out what "quality" (to stick with the example) really means in the context of your presentation. Only then can you really visualise it; and the result will be much more memorable than the generic visualisation that you would otherwise have come up with. 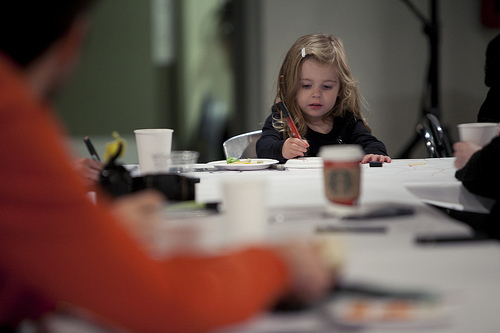 (Image Credit: Draw By Night (Nov '11) by VFS Digital Design, from Flickr. "How to come up with relevant visuals" by Dirk Haun is licensed under a Creative Commons Attribution-ShareAlike 4.0 International Licence.